Well, here's a great chance to start and see what you've been missing! What's Studio J, you ask? 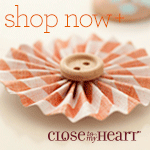 It's CTMH's on-line scrapbooking program. Now you can try it out on my website FREE! You will need to set up a customer account, but don't worry, that doesn't obligate you to anything! Just click here to see. 1. 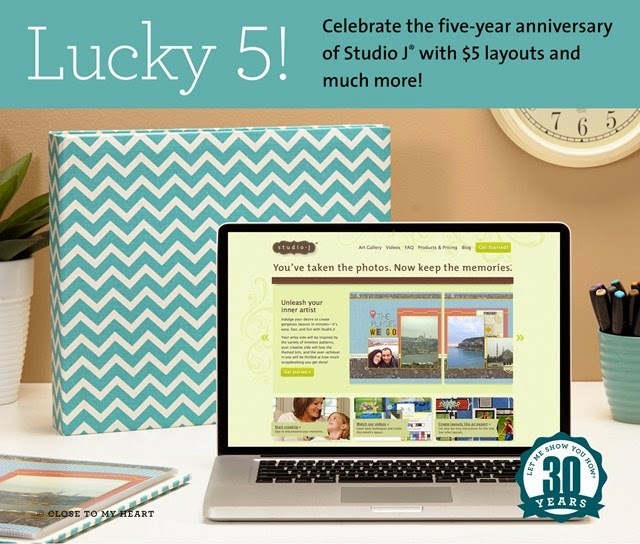 First, throughout the month of November, all layouts purchased in Studio J are only $5! That is a savings of over 25% off of retail! 2. Your second chance to win big must come by sheer luck: every fifth order placed in Studio J during November receives a FREE surprise Close To My Heart accessory in its shipping box! The accessory has a retail value of $5 or more. 3. If luck doesn’t smile on you in that way, you might stumble upon it by finding a little extra something in your Studio J box. Five “golden tickets” will be sent out during the month of November with randomly selected Studio J print orders. This “golden ticket” is redeemable for one of Close To My Heart’s new D-ring albums* loaded with 10 Top Load Memory ProtectorsTM. 4. For a fourth way to win, simply create new, gorgeous layouts in Studio J, select your favorites, and then post pictures of them on Close To My Heart’s Facebook page using the hashtag #ctmhlucky5. After November 30, five lucky winners will be selected from the entries based on their artistry and creativity and each of these winners will receive their own D-ring album loaded with 10 Top Load Memory Protectors! 5. And there is one last way to win: take your new Studio J artwork and post a picture of it on Instagram using the hashtag #ctmhlucky5. Just as it is with Facebook, after November 30, five lucky winners will be selected from the entries to receive their own D-ring album loaded with 10 Top Load Memory Protectors! five may be new your new lucky number! Log in to Studio J and start creating today. to winners will be at Close To My Heart’s discretion based upon availability. New kits available in Studio J® on November 1 include Confetti Wishes, Snowhaven, Seaside, Pathfinding, and Scaredy Cat. No tax or shipping will be charged on the free item(s). Studio J layouts ship in a protected box that can hold from 4 to 50 two-page layouts.